About the Land features eight contemporary artists. 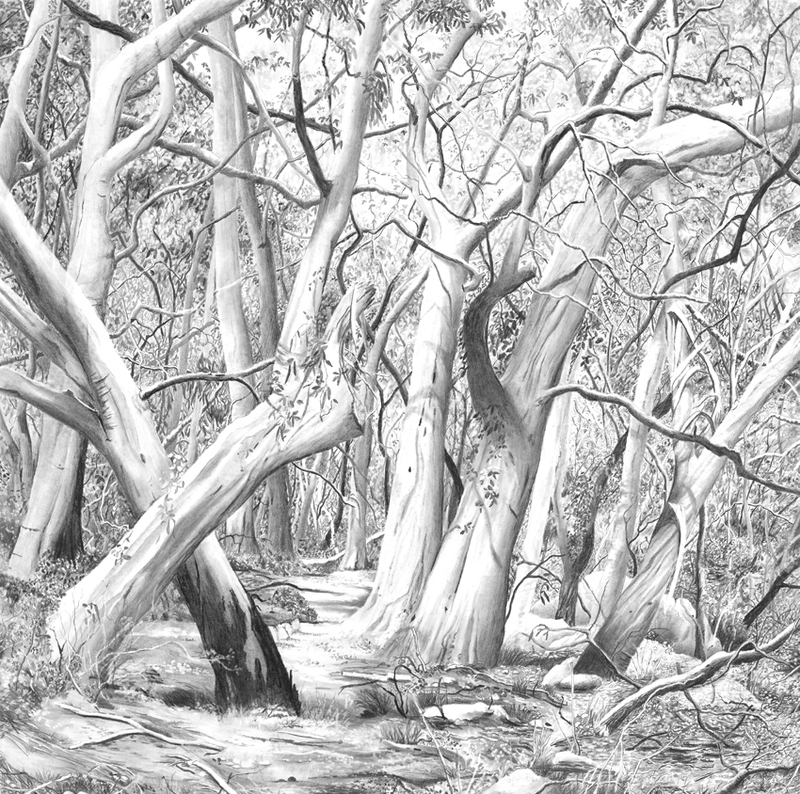 The intricate, large scale works of Raymond Arnold and Dianne Fogwell portray specific ecological sites and species with stunning detail and sensitivity. 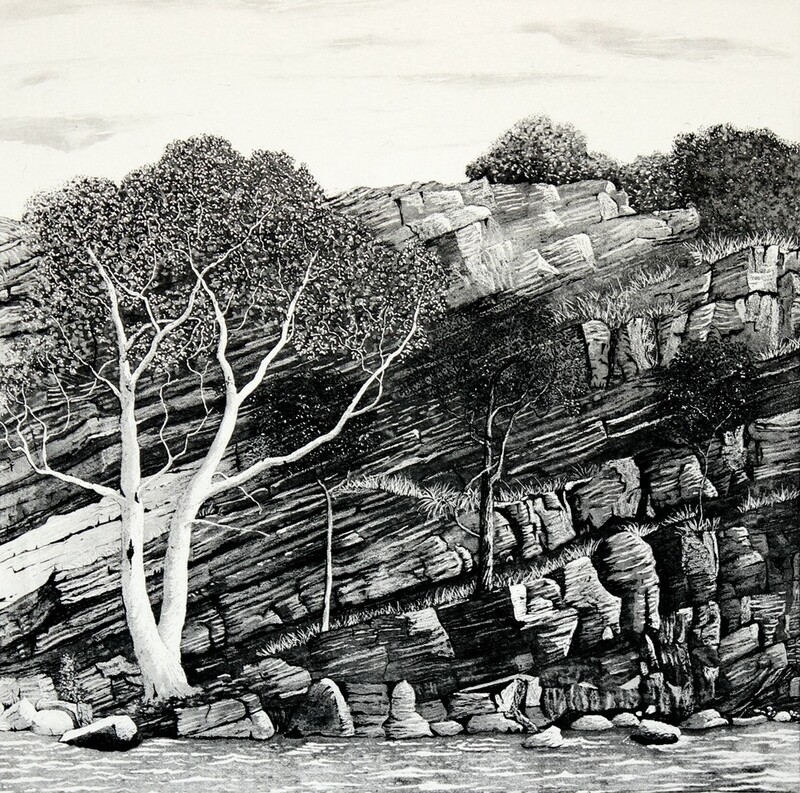 Distinctive, rugged and compelling, the prints of Arnold and Fogwell draw the viewer into the bold, yet delicate mark making of their etching and linocuts, which powerfully echoes the nature of our ancient landscapes. G.W. Bot has devised over many decades her own pictorial alphabet of ‘glyphs’ to record her experience of the Australian bush, while Wayne Viney conveys the visceral experience of the landscape through tone, texture and bold silhouettes. The sublime essence of nature is eloquently conveyed through abstract forms, as each artist sets down their response to the natural world through a highly personal lens. 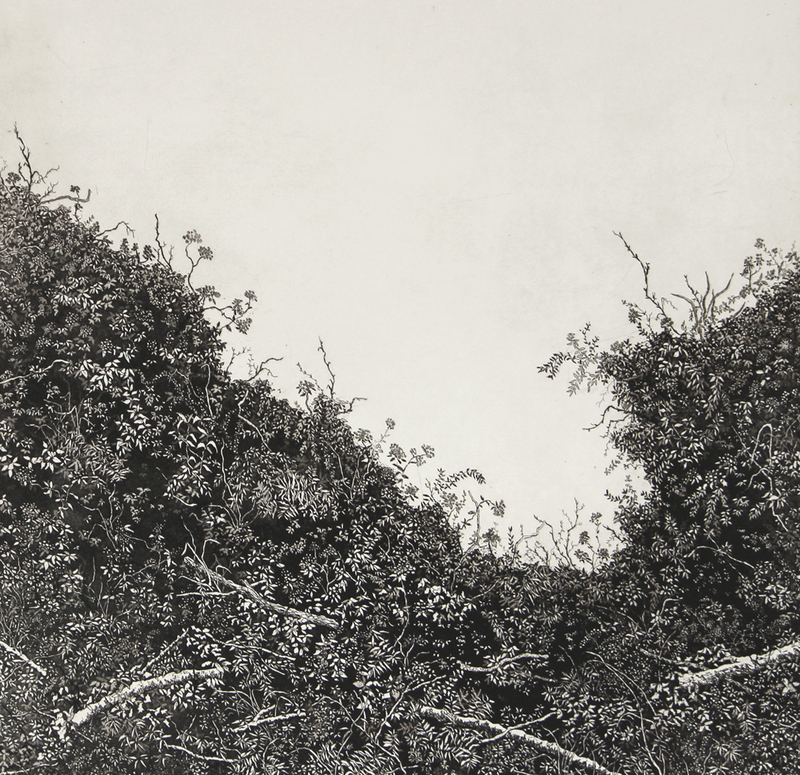 The poignant lithographs and charcoal drawings of Christine Wrest-Smith and etchings of Stephanie Jane Rampton reveal both artist’s reverence and close observation of their natural surroundings. 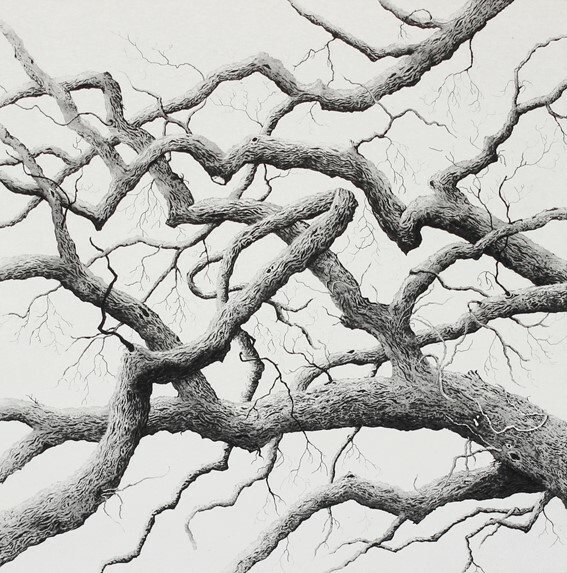 Deftly rendered branches, leaves, bark and nests bend and intersect, inviting the viewer to experience the textures and forms present in the landscape. These works evoke a sense of the familiar, of our own memories and emotional connection to nature. Monique Auricchio and Kyoko Imazu are highly proficient printmakers, each exploring a rich colour palette and deep shadowy tones through the etching and aquatint processes. Both Auricchio and Imazu are known for the poetic intertwining of real and imagined elements; animals, plants and landscapes are portrayed with an eye for the surreal. Both aesthetically and thematically, Auricchio and Imazu strike harmonious balance between light and dark, and their captivating works evoke many states of life and death, dreams and memories, darkness and renewal. Artists Wayne Viney and Stephanie Jane Rampton discuss their work in the show ‘About the Land’ at Australian Galleries, featuring eight contemporary artists whose common approach towards printmaking processes reveals remarkable diversity of expression. Positioning landscape as the central subject in their practice, each artist communicates their individual perspective and unique technical expertise through a shared source of inspiration. Imprint: What is the premise for this exhibition and how have you been working towards it? Wayne Viney: I first saw Lake Charm around 2005. I was returning from Swan Hill where I’d had a work in the Print Award. I was surprised seeing this huge lake near Kerang in north-east Victoria. I stopped and did a couple of quick drawings and went back a few months later and did more. I thought it would make an interesting series but it wasn’t until 2017 that I finally decided the time was right. The palm trees were intriguing, and looked so incongruous sitting there on the horizon line that I was instantly drawn to them. They became more prominent as the series progressed. They were like exclamation marks in an otherwise flat landscape. I knew the landscape around Lake Charm was a gift in terms of composition. The irrigation channels created strong diagonals which balanced the horizon line, thus leading the viewer into the landscape, a classic compositional device. The Lake Charm series is the most literal work I have done in some years, marking a return to more representational landscape. I’ve been working on ‘minimal’, almost abstract, landscapes for several years, and felt it was time for a change. 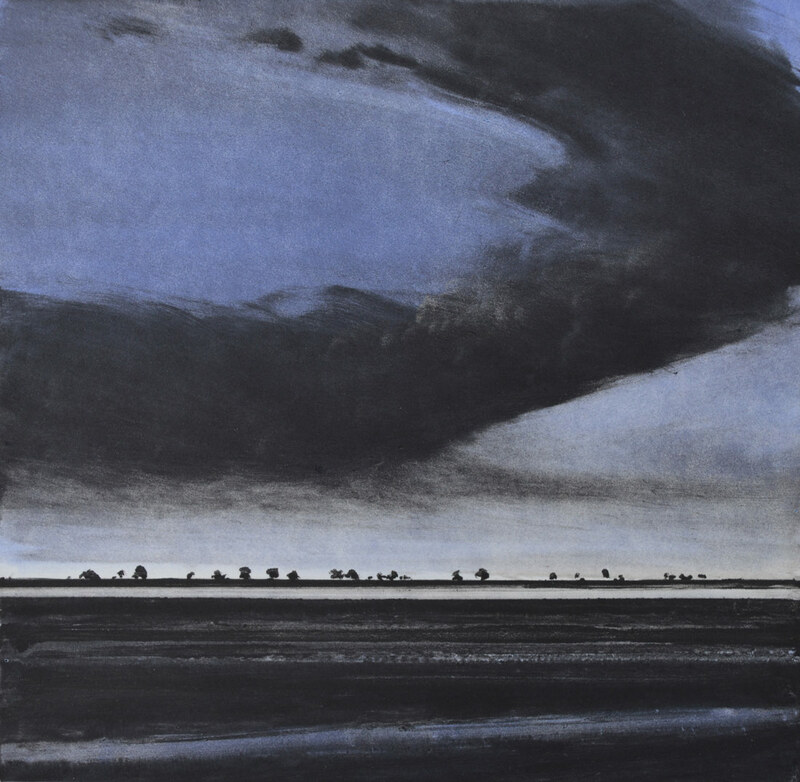 Those works are refined and elegant, almost entirely devoid of mark-making, emphasising subtle colour combinations of skies above a long dark band of sea. With this new work I was conscious that I wanted to loosen things up, to make it fresher and more spontaneous. I wanted the brushwork to be visible and the excitement I felt to be apparent. Imprint: What are some of the foundation ideas for the work in the exhibition, and what are visitors likely to experience? 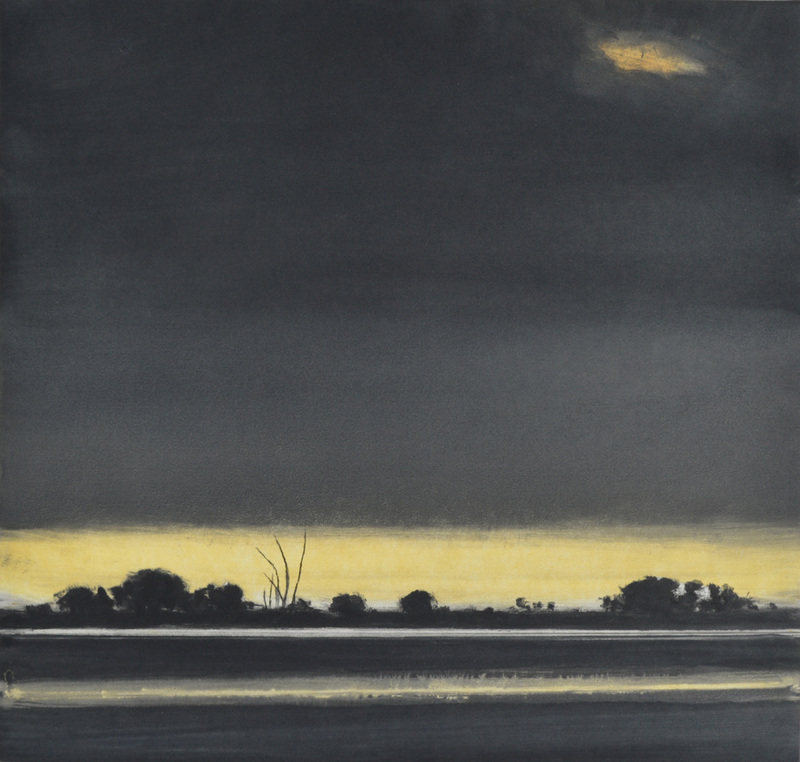 Wayne Viney: I always saw the Lake Charm series in terms of a low horizon with a band of trees reflected in water, a relatively static image. The drama as such could then take place in the skies above; the weather, the changing light, clouds forming and storms passing. I relished the opportunity to create these rather dramatic effects. I thought of the landscape below as timeless and unchanging, while above, clouds pass, storms come and go and the seasons change – the transience of nature. This notion of the romantic landscape is something I’ve always been drawn to, working with the elements of sky, water and land. Imprint: How was the work developed technically and what were some of the challenges involved? Wayne Viney: The monotypes are quite spontaneous, each image was painted quickly on a copper plate, referenced from drawings done on location. I used two plates; one for colour, which was printed first, and the other for the main image. Areas that didn’t work were wiped clean and redone in seconds, a distinct advantage of the monotype process! I knew this series would predominantly be black and white, with minimal colour, to emphasise the sense of the dramatic that I wanted to bring to these works. Imprint: What future projects are you working on? Wayne Viney: I’ve enjoyed depicting the landscape in a more literal way with the Lake Charm series, and will continue to develop it. At the same time, I’m still attracted to my more abstract work, utilising increasingly bold colour combinations and bands of colour to evoke the essence of land, sea and sky. Imprint: And Stephanie – how was your work developed technically and what were some of the challenges involved? Stephanie Jane Rampton: I work from sketches and photographs I have taken, often combining elements from these to create new compositions. Plates begin as line etchings, sometimes just rough guidelines, before I add aquatint. In order to get many layers of tone I will stop out and etch each plate up to 15 times in increments of 20 or 30 seconds. The challenge with working this way is that by the middle of the aquatint process it is a case of trying to remember (or guessing!) what is underneath. The other major challenge for me as a printmaker over the last 7 years is having had 20 operations on both hands after breaking my wrists! Stephanie Jane Rampton: I was recently asked to produce etchings to illustrate a children’s book by author Richard Dove. Kyoko Imazu and I had discussed a collaboration for some time and this project proved to be the perfect opportunity for us to do so. The illustrations are proving to be successful so we will also be producing a suite of etchings apart from the book. Alongside this I will continue to develop my own practice, examining the minutiae of the natural world.